On Paul’s second missionary tour, he decided to go alone to the most famous of the ancient Greek cities, Athens. Named after the patron Greek goddess Athena, Athens is one of the world’s oldest cities, with recorded history of over three thousand years. 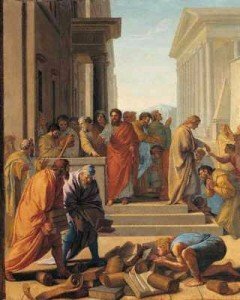 During the time period that Paul would have visited Athens (50-51 CE), it probably had a population of fifty to seventy five thousand people and was home to many of the great Greek thinkers of the day. The city prided itself on being intellectual and had several buildings where the leading men of the city debated the great theological ideas of the time. The city of Athens was absolutely full of temples to the various Greek gods. An ancient proverb said, “In Athens, there are more Gods than men”. There were temples to at least twelve different gods, plus hordes of statues to lesser deities throughout the city. The main attraction in Athens was the acropolis, the highest point in the city. 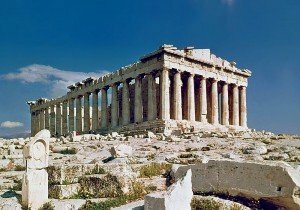 On top of the acropolis stood one of the most magnificent structures in antiquity, the Parthenon. Already over four hundred years old when Paul would have seen it, it was one of the most famous temples in the world. With a height of over 50′ and 70 beautiful marble columns, it could be seen for miles in every direction. Inside the temple stood a forty foot statue of the goddess Athena. Then Paul does something in Acts 17:26-28 that really gets their attention. Instead of quoting to them from the Hebrew Scriptures to try to convince them, Paul quotes from their own Greek poets to describe the creator of the universe. He gives lines from two of their well known scholars, Epimenides and Cleanthes to present YHVH as the creator of all, giver of all, and ruler of all nations and all of history. He used their philosopher’s own words to support his claims! Then to sum it up, Paul tells these great intellects that his God is not some object made of gold or marble to look like man’s image, but that He is much bigger than a mere statue and is immortal, invisible, indescribable, and His name is unspeakable! Then Paul tells them that in the past they were ignorant of this and God overlooked it, but now that I am telling you the truth, you must repent! There is a day coming and you will be judged! What was their reaction? Some sneered at Paul and some said,”We’ll hear more later”. It also says that a few men believed. In all, Paul doesn’t get run out of town like he usually does, but there doesn’t seem to be much evidence of big changes in the hearts of the people of Athens. There is no other written evidence that Paul ever returns to Athens. Paul may be speaking to these same type of people when he wrote to another Greek city in 1 Corinthians 1: 20-31, “Where is the wise man? Where is the scholar? Has not God made foolish the wisdom of the world? We preach Christ crucified, a stumbling block to the Jews and foolishness to the Gentiles”. As we stated at the end of our second lesson, the key to understanding the concept of faith and how it relates to works, is found in the meanings of the Hebrew and Greek words that are translated faith. As we have discussed before, Hebrew words often have so much meaning packed into one word that it is hard to use just one English word to describe it. This is definitely the case with, “emunah”, the Hebrew word most often translated faith. “Emunah” comes from the root word, “aman”, which means to support, to confirm, make firm, or make lasting. From the word, “aman”, we also get the word amen. When we say amen to something, we are saying that what was said was reliable and trustworthy and, “may it be so”. The word, ”emunah” also derived from “aman”, means faithfulness or trustworthiness. It indicates constancy, stability, steadiness, and reliability or support. In Exodus 17:12, its first use in the Bible, it is used the following way: “But the hands of Moses grew tired, so Aaron and Hur held his hands up and his hands remained, emunah till sundown.” This first Old Testament usage sets the tone for succeeding occurrences of the word. When emunah is used of God, it points to His utter dependability and unwavering faithfulness. Psalm 119:86 says, “All his commands are emunah.” Emunah is also used to describe human beings. It refers to those who have the capacity to remain stable (faithful) among the unsettling circumstances of life. One of the most pivotal passages in the Old Testament where emunah is used is in Habakkuk 2:4. Paul later quotes this same verse in Romans 1:17 and Galatians 3:11 to explain his position that, “The righteous will live by his emunah” or “faithfulness” (See NIV footnotes on Habakkuk 2:4). In the context of Habakkuk, the Jewish people were about to fall on hard times. God was going to send another nation to punish them and these times were going to require a deeply rooted reliance on God. A person would have needed stability and support (emunah) to survive the coming days. Emunah, then, was an inner firmness and peace, the strength and constancy of a man’s soul. (See Our Father Abraham Pg. 182-185 for a more detailed explanation of emunah). The Greek word that scholars most often translate to the English word faith is ”pistis” (Strong’s 4102). If you look up the meaning for pistis you will find that it means either a strong conviction or belief or, “faithfulness”. In fact, the Greek Lexicon shows the meaning for pistis to be faith or faithfulness. To the Hebrew and Greek minds then, faith was much more than just believing in your heart or an attitude of trust. To have faith was to have confidence in God and to step out into life and act on that confidence. To have faith was to live a life of faithfulness. Emunah and pistis are both faith lived out or faithfulness. If we then understand the word faith to be faithfulness, then it all starts to make sense. If you go back and start reading Paul’s writings and the writer of Hebrews and put in faithfulness where faith is used it makes very interesting and enlightened reading. For example, Hebrews 11:1-6 says, “Without faithfulness (inserted for faith) it is impossible to please Him and He is a rewarder of those who diligently seek him.” All the heroes of the faith in Hebrews 11 are examples of faithfulness; they lived out a life of faith. They believed his promises, relied on Him and went out and acted on those beliefs. Now let’s go back to Galatians and read Chapters 2 and 3. Paul says that we are not justified by keeping the law but by faith. Galatians 3:2 says, Did you get it by observing the law or believing? Then, in Galatians 3:11 he states that the righteous will live by emunah (the Hebrew from Habakkuk 2:4) or pistis Greek in the NT). The million dollar question is, what is faith? Faith lived out is faithfulness. Obedience is part of what the nature of faith is. We know that by His unearned love (grace) that we have come to know Him, and it stems from nothing that we can do in and of ourselves (see Ephesians 2:8-9). It’ s all God, but by believing these truths, which is faith, we are to live out a life of obedience. How could we not, knowing what He has done for us? If God has truly gotten a hold of us, we will have a passion to walk as he did. Our faith will be expressed in loving God and our neighbor. James 2:14-26 says, that faith without actions is dead. 1 John 2:3-6 really puts the icing on the cake for this subject. “We know that we have come to know Him if we obey his commands … whoever claims to be in Jesus, must walk as Jesus walked”. Our faith comes from God as a gift; we can’t earn it, but living it out is the natural response to His love towards us. 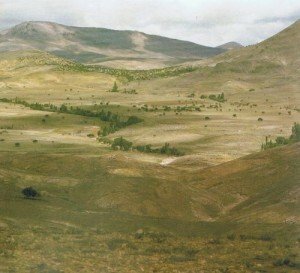 This was the problem in Galatia, people were pushing the Gentiles to do Jewish things as a way of earning their spots in the community. You had to be circumcised, eat kosher, etc. Paul was saying, no! None of this is of any value. The only thing that counts is faithfulness, expressing itself through love (Galatians 5:6). 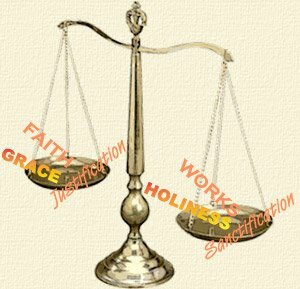 Now read the book of Galatians, the book of grace, and substitute faithfulness where the word faith is found and see if the conflict between grace and works isn’t resolved.